A update on Tara, the hero cat. The Bakersfield Blaze originally invited little dog bite victim Jeremy Triantafilo to pitch the ball, but fans believed the famous feline was somehow handling the honors herself. ‘We now have four days to figure out a way to teach this cat to pitch,’ Philip Guiry, the team's assistant general manager, joked to the Daily News. Already a major hit online, Tara the tabby is heading to the minor leagues. The California cat that raced out of nowhere and went berserk on a neighborhood dog attacking her 4-year-old owner has been tapped to throw out the ceremonial first pitch at a Bakersfield Blaze baseball game next Tuesday. A team spokesman said they originally invited bite victim Jeremy Triantafilo, the toddler saved by Tara, to throw the first ball, but the announcement and media coverage led fans to believe the famous feline was somehow handling the honors herself. "We now have four days to figure out a way to teach this cat to pitch. I've got David Blaine on the other line," Philip Guiry, the team's assistant general manager, joked to the Daily News on Friday. 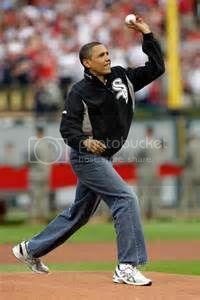 My guess is Tara will throw the ball better than the girlyman, Barack Obama. Yes Tara and her 4 year old person both throw the ball in a more masculine manner than the girly-man. BAKERSFIELD (CBS13/AP) — A cat that became famous for saving a central California boy from a dog attack threw the first pitch Tuesday night at a Bakersfield Blaze baseball game – or at least she tried. They're both of the feline persuasion, if you know what I mean.